This is something I’ve been trying to figure out since before Christmas. I got a Fender USA Jazzmaster bridge (what I thought was AVRI), and I couldn’t lower it all the way down to the pickguard. 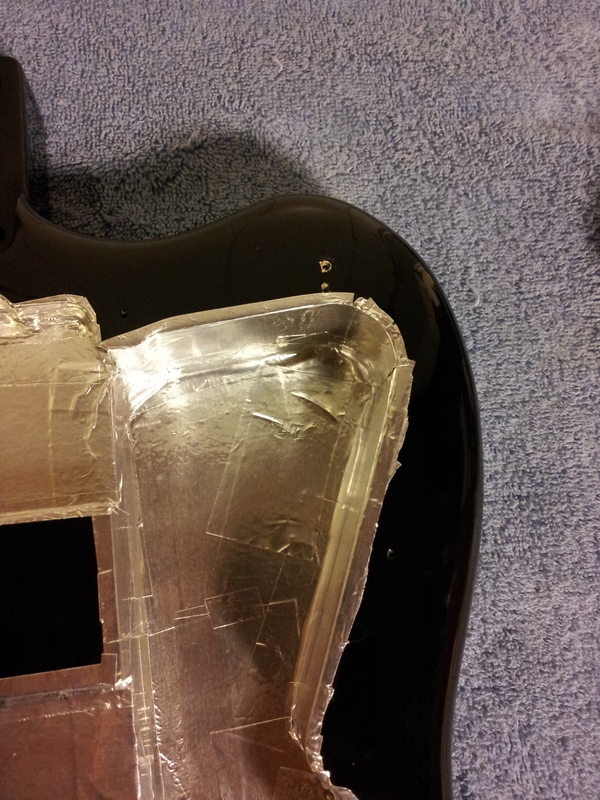 There’s a gap of about 1/4″ between the pickguard and the bottom of the channel. The height screws each have a slot that runs along them, but that wasn’t the problem. I also ruled out any obstruction within the posts because both screws go in the same amount. 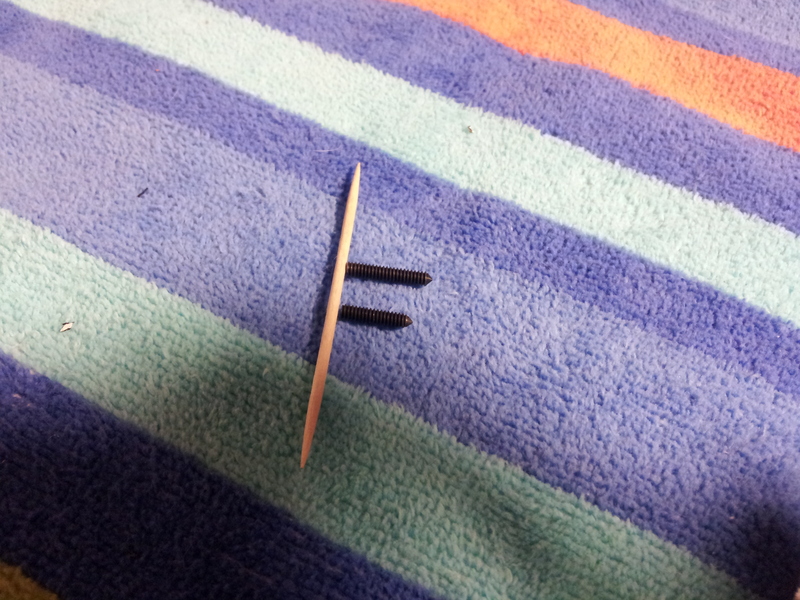 That is, the pointed side sticks out the same amount on both sides. You can see in the picture above that the bridge is parallel to the body. 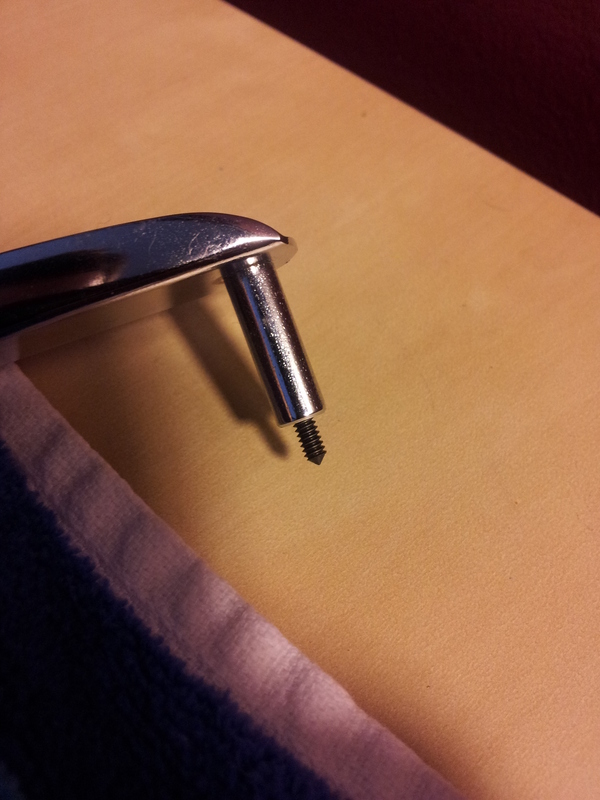 Here’s one of the screws with the slot that runs along it. I started digging around and I figured that the bridge I have isn’t from the AVRI (American Vintage Reissue) series. The AVRI line was discontinued this year (I mean, in 2013) and replaced by the American Vintage Series (no one’s calling it AVS yet). My bridge was from the latter (part number:0054460000). 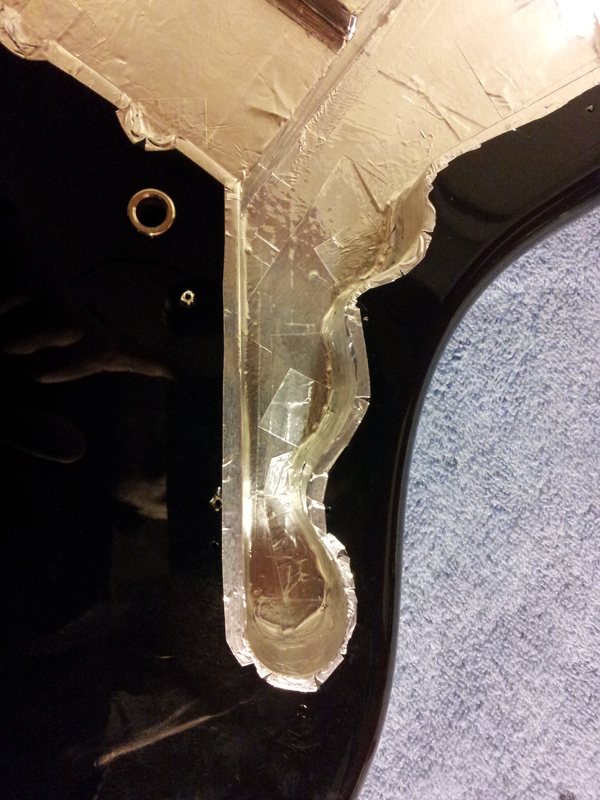 Since no one with an AVRI Jazzmaster at OSG ran into this problem, I realized that the bridge is the culprit. The advice I got from OSG was to buy new screws from Guitar Parts Resource, but I couldn’t see how those would make any difference. 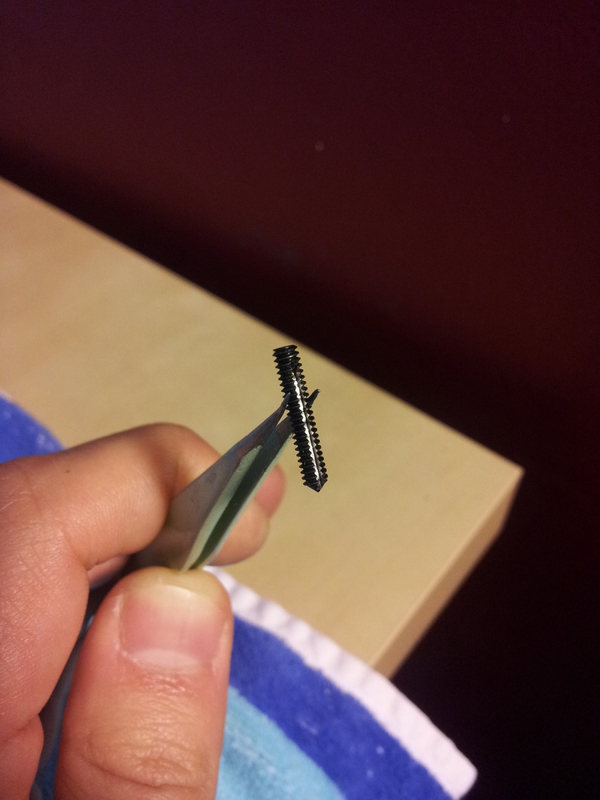 I already have new screws! They came with my bridge. So in a desperate attempt to figure out what’s going on, I decided to message offset guitars aficionados Mikes & Mike Guitar Bar. When I told them the bridge isn’t AVRI but AVS (I’m making it a thing), they told me that these Jazzmasters, which are modeled after 65s, have a taller neck and Fender must have compensated for that at the bridge. I took the advice I got at OSG and bought a pair of new screws ($3) along with a new channel for the bridge from Guitar Parts Resource, but not before verifying with them that the channel is for 62 reissues, i.e. AVRI. One of the two had to be the problem, and I didn’t feel like ordering one first, then ordering the other if the first didn’t solve it. At first I thought that Fender just made new bridges for the 65 reissues, but in reality that doesn’t make sense. 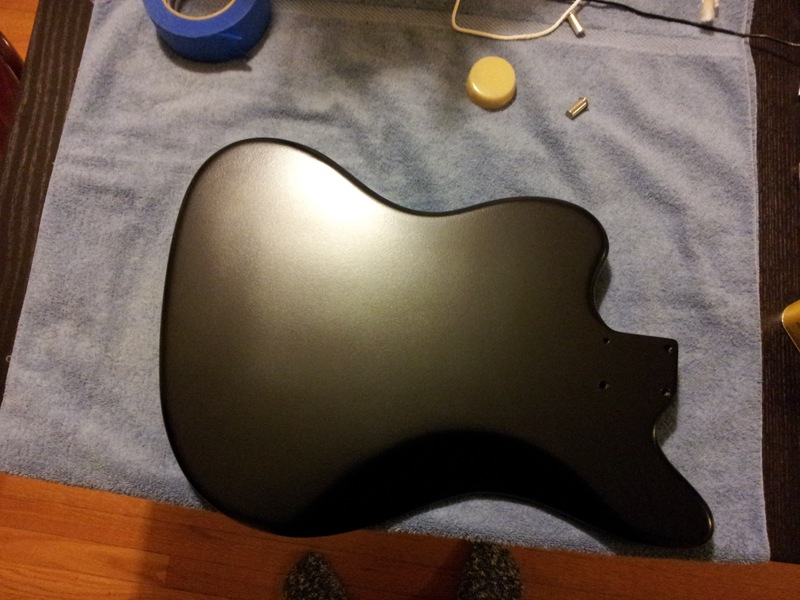 Because the necks are taller, lowering the bridge all the way to the pickguard probably made it buzz like crazy. On the other hand, it could be useful to get the bridge really high in case the player uses 2-3 shims and likes a high action. Making a new bridge is a lot more expensive than sourcing new screws (not to mention making things untrue to the vintage models), so Fender went with the new screws. So in case anyone ran into this problem and didn’t know what to do, the answer is to buy a pair of screws from Guitar Parts Resource or Angela. 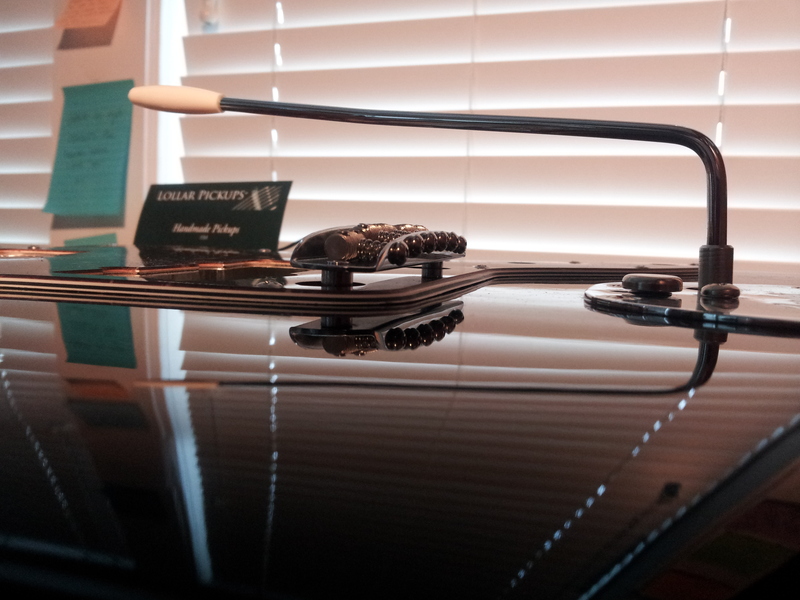 November 12th, 2015 EDIT: I’ve never worked on a 65 Jazzmaster, but I talked to someone I know today and he said that neck pockets on those are angled, so this built-in neck angle necessitates a taller bridge. Also, I think the screws I got from Guitar Parts Resource might be made in outside the US and have lower tolerances, because when I dig into the guitar the bridge starts lowering itself slightly. 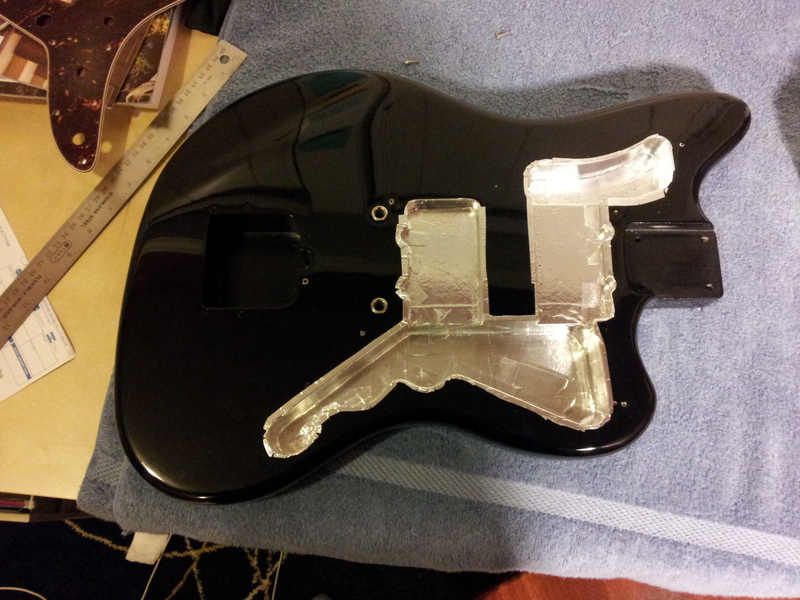 Also, with the neck shimmed on my Jazz, the bridge is already pretty tall, so these screws would have worked for me. Wet sanding, polishing, shielding, and a gouge! I started by filling all the holes, with the exception of the neck pocket holes, with beeswax. The wax prevents water from going in them, swell the wood, and therefore make the lacquer above it crack. I held off on buying beeswax because any store that had it had just a tiny bit of it, and it seemed to be really hard to the point where I won’t be able to easily cut it and shape it. The size really isn’t a problem, because I think I can easily do 30 guitars with the small amount of beeswax that I got. As for its hardness, it is indeed hard, but I could cut a small piece with a knife, and then roll it in my fingers to make it fit the holes. I then cut the excess with a ruler or something, but I also discovered that if you sand the excess, it won’t mar the finish or anything. At best it clogged the sandpaper. Unfortunately, some holes weren’t 100% plugged, and water got in them and caused cracks. 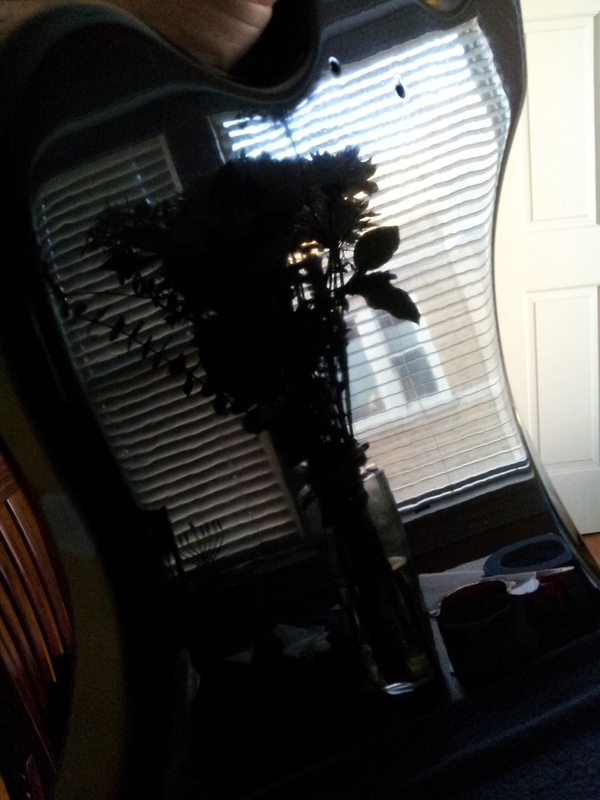 Next time I’ll use more wax, wipe off the guitar more often, and really just use the water to clean the sand paper. For what it’s worth, though, the cracks were very thin, and I don’t see or notice them anymore. Besides cracks, I also had to deal with sand throughs. 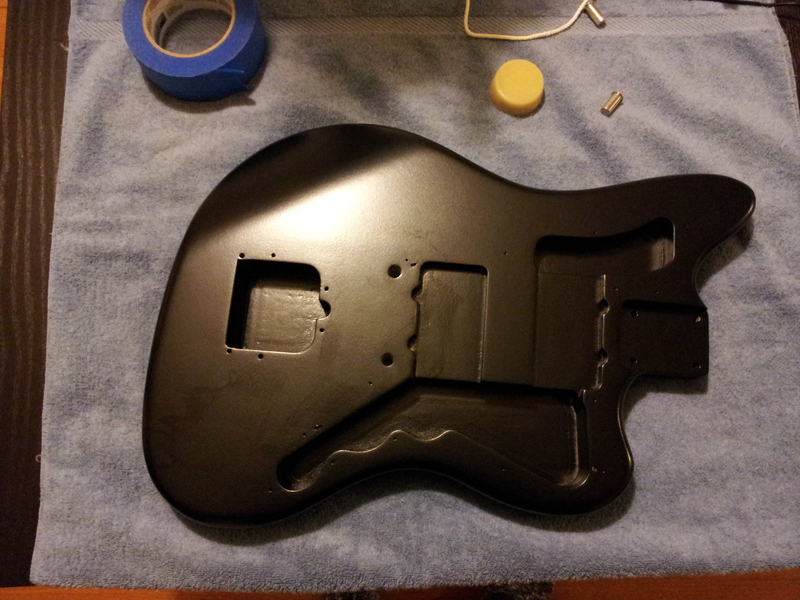 I wrote in one of the last posts that I gave up on spraying clear over black and ended up spraying four coats of black over the five coats of clear I had on the body. I should explain why four. For “thin skin” finishes, it is recommended to spray 9 to 12 coats of clear over the color coats. I already had 5 coats of clear on and a very thick first coat of color, so I thought four (for an overall of 9ish final coats) should keep it thin. I also tested it before spraying and four coats were enough to not sand through. 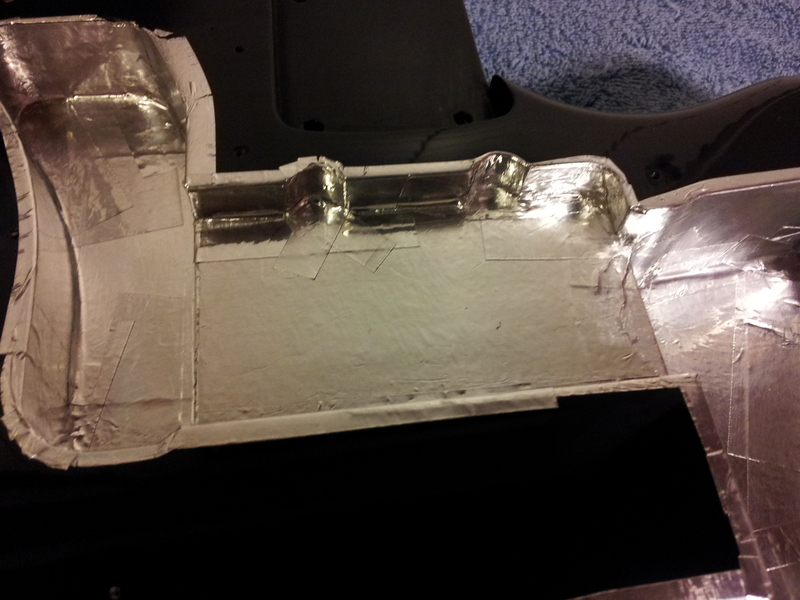 However, I think I started sanding through to the clear coats underneath a little bit. The only indication I have for sanding through is that the water (as I was sanding) wasn’t pure black like it did earlier in the sanding, it was a little diluted. Usually, sanding clear lacquer makes the water turn white, but I didn’t get that far. However, the sand throughs must be minimal, because I can’t see any discrepancies in the finish. Still, next time I’ll put on six final coats or more (if I don’t spray clear). The sand throughs were a result of how long and hard I had to sand. Sanding took maybe 5-6 hours (if not more) starting with 800 grit all the way through 2000, and I had to press really hard to sand anything. This was probably the result of how long I waited to sand. 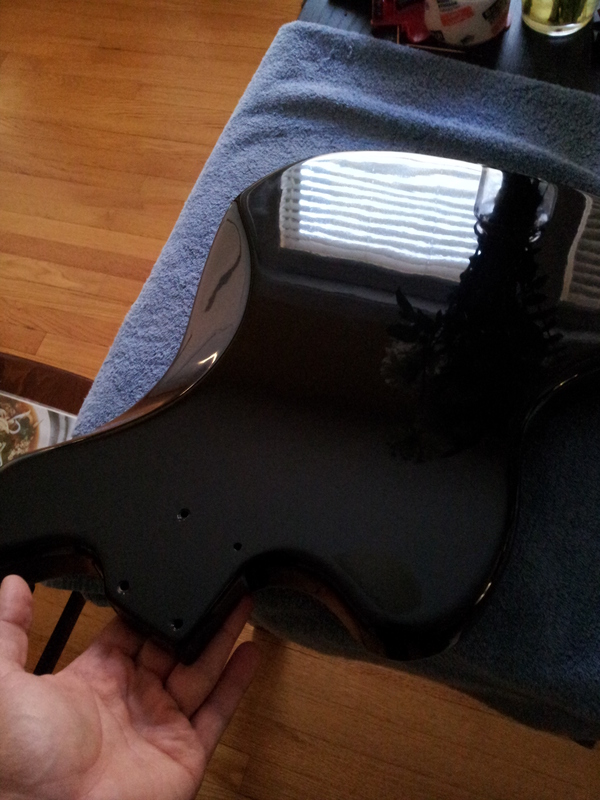 For instance, the neck of this guitar I sanded five days after I finished spraying, and it required minimal effort to do. Next time I’ll wait five days, then test the lacquer by pressing with my nail at a hidden spot. 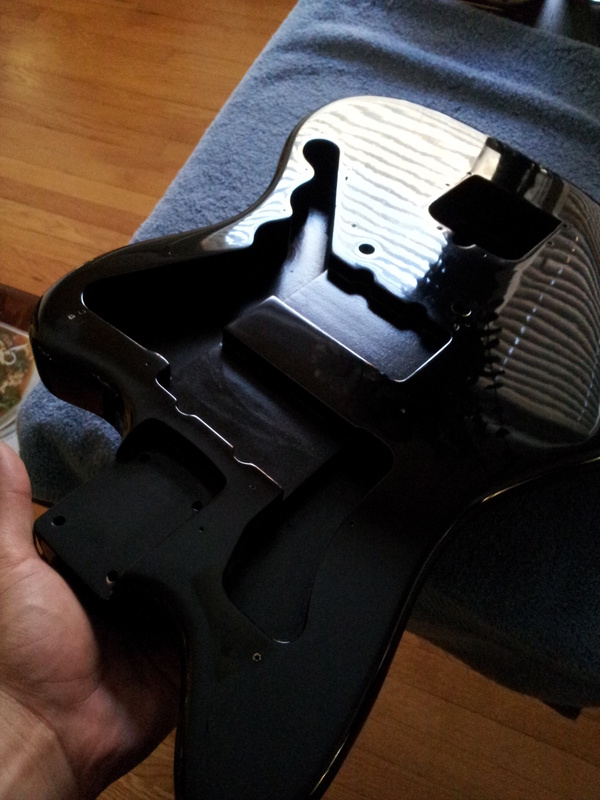 If there’s no impression, I’ll wet sand, and then let it dry for 20 more days, then rub it with a compound and polish. The polishing can be done along with the wet sanding, but since it’ll hang to dry and collect dust, I prefer to polish last. Speaking of polishing, when I first started reading about how this is all done, I thought I’d need special material to rub on the compound and polish. So I bought a buffing pad and I’ve never used it. The reason I’m not using it is that I first wanted to practice wet sanding and polishing on a scrap piece of wood with lacquer, and I didn’t want to waste the buffing pad. For that, I used a white cotton t-shirt. The results looked great, so I stuck with it. It’s best to use an older t-shirt that has been washed a bunch of times. This way it has less lint. The compound and polish I use are Meguiar’s Ultimate Compound followed by Meguiar’s Ultimate Polish (in this order). Here’s the end result. 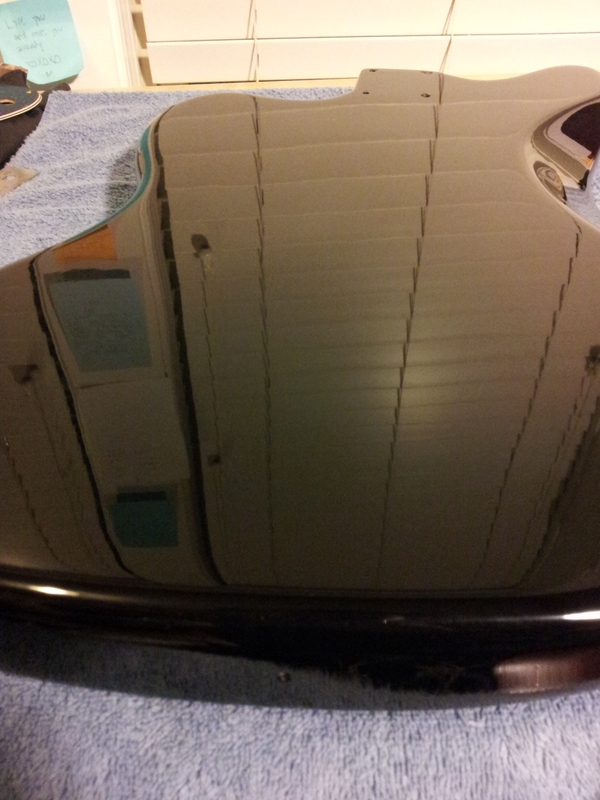 It’s hard to take a picture of a black finish, because it really just acts as a mirror. I think the Meguiar’s products do a good job and make it look real shiny. I took a picture of the back when I took the pictures of the shielding, and that picture looks better than those I already posted. So why not show it off. Don’t wait 30 days to sand (but do wait 30 days to put the hardware on, etc. ), just five days or maybe a week. Plug well with Beeswax and don’t let so much water get on the body. It’s better to go thick and not thin skin than sanding through. I was lucky this time around, but might not be so lucky next time. As for the gouge — too soon for me to talk about it. Too soon.